Join NAGC and help support research, education, and advocacy for gifted and high-ability children. NAGC seeks to keep supporting gifted and talented children at the center of all that we do. 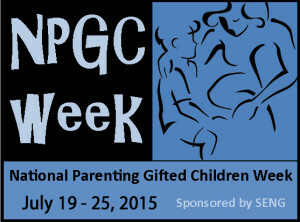 From July 19-25, NAGC adds to our ongoing advocacy efforts and awareness building activities the celebration of National Parenting Gifted Children (NPGC) Week 2015. We will share news throughout social media and with our community, and hope you will do the same! Several years ago, NAGC partnered with SENG to list NPGC Week in the National Special Events Registry. NPGC Week celebrates the joys and challenges of raising, guiding, and supporting bright young minds. Making Sense of Bullying and the Gifted: What Do We Know and What Can We Do to Prevent It? Starting & Sustaining a Parent Group to Support Gifted Children. NAGC members have access to complete issues of the award-winning Parenting for High Potential magazine. Join today! Using vignettes, author Tracy Misset explores the social and emotional characteristics of high-ability children.